Exposure to computers from an early age helped me feel comfortable and confident when creating with them later in life. Written by Adam on July 30, 2018. Updated April 24, 2019. 9 min read. Personal. 6 comments. This article is part of the free Get to know Adam Series. 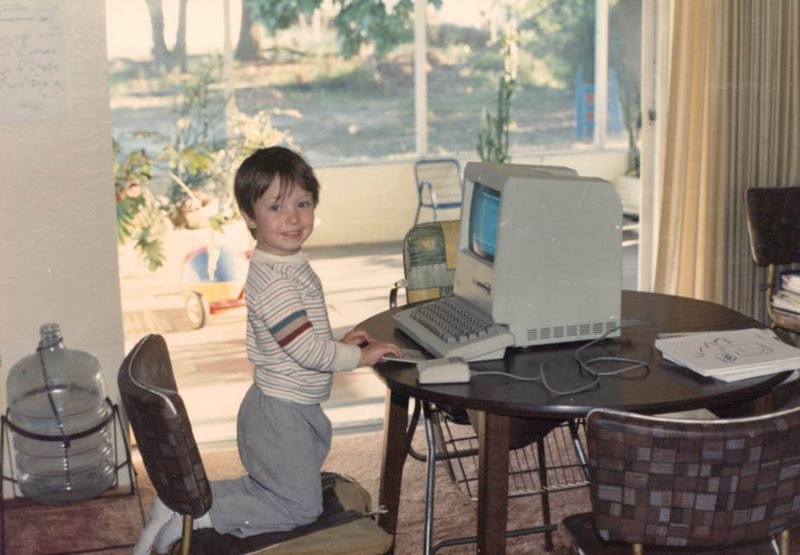 I was lucky enough to grow up with computers from a very early age. My dad worked at a company with a Mac-heavy environment in the early 80s — the time before Microsoft was a household name when Apple (still) was the brightest star in the personal computer market (funny how things come back around). It’s hard to explain how critical this early exposure to computers shaped my confidence and understanding of them throughout the years. I didn’t touch a smartphone until an iPhone 3G when I was 27. Before that, it was heavy tower computers and laptops all the time. This experience shaped my education, my job prospects and creative endeavors. My earliest memories on a computer were using it to draw. I’m guessing this might’ve been a precursor to Photoshop back in the 80s – something with minimal options. I never worried about “messing things up” on the system — it just wasn’t a concern. Instead, I focused on important things like how to change the icon for a folder. Later on learning how to format and reset a system was like learning a superpower. It guaranteed that my playground would be working. The movement of kids from computers to phones and tablets does have me concerned about the creative side of innovation in a generation of people using devices that were created on a different system. But it also has me optimistic! I’m extremely curious what kind of tools, interfaces, and experiences will be created by the first generation of users on these new interfaces. Even though I started before a time on the internet, I never had a desire to build desktop software for the systems that were currently in place. It wasn’t until something came that changed things, and I was able to watch grow up and take shape that I felt a passion to be a part of it. That new medium was the web, and I was addicted to it from when I first used it in 6th grade. Over the next decade, the web became more than just data – with social networks being one of the most interesting innovations. I wonder about what that “next thing” is for younger people currently taking shape? Is it VR? Augmented reality? 3d printing? Communities where the users are the builders (Minecraft)? Interactive surfaces? Although I’m jumping in on these, I can’t wait to see what’ll happen! Note: I really hope it’s augmented reality. I’d love to be able to put on a pair of glasses and see an annotated version of the world – but also be able to take it off. We had many computers at home growing up. A Macintosh, an Apple LC II, an IBM 386, a 166 MHZ computer and more. These were computers my parents needed for work that I was able to learn and play on. Having access to both Mac (at my Dads house) and DOS (with my Mom), I had experience with both, but unfortunately never got great at the command line. That early lack of command line experience had a big impact later in life, making my switch back to a Unix based Mac more of a bumpy right later on. Fast forward to sophomore year of high school and I finally bought my own computer — a 333mHz Compaq Laptop. With divorced parents, having a laptop made a lot of sense at the time. Like most of my friends and fellow students at our Center for Advanced Technologies Magnet, I went the Windows route. It wasn’t too long before scraping together parts to build something bigger. It would’ve been nice to be exposed to an object-oriented language, but even this was an amazing education for someone graduating college in the year 2000. This high school exposure to programming and multiple system types was an amazing way to get an introduction to core concepts. It’s funny how simple exercises stick with you when you make breakthroughs too. Making my first tic-tac-toe program, and creating my first binary search tree are some of the most memorable experiences programming during high school. Senior year in robotics class, back in 2000, we even did a crazy project. There were 2 class times during the day, and they were set up to compete with each other. In one class, they were tasked with creating a vehicle that would be gyro stabilized on a ball and move around avoiding a predator from above. In the other class (which I was in) we were tasked with creating a blimp which would need to fly around and try to dump flour on the ball vehicle. Did I mention that both of these needed to be autonomous vehicles without user control? It should be noted neither class got a working vehicle, but we did learn a ton about autonomous vehicles, blimps, movement and programming for a 486 motherboard. This was in a time before Raspberry Pis, where you could only flash a motherboard with the code once and it’d be permanent. If you had a bug in your code or needed to make a change, you needed to buy another motherboard and flash it. Today, kids who are able to build their first Minecraft or Super Mario Maker levels while in elementary school are getting this same feeling of creation at an amazingly young age. It’s an addictive feeling, and with more time to build on it, I can’t wait to see what’ll happen. When I finally moved into a house, it was obvious that I’d need an office to really program at. It’s funny to think that just 12 years ago I was still a Windows person, not to mention a desktop. Since then I’ve only had 2 MacBook Pros – which goes to show how long they last. The first home office I ever set up. 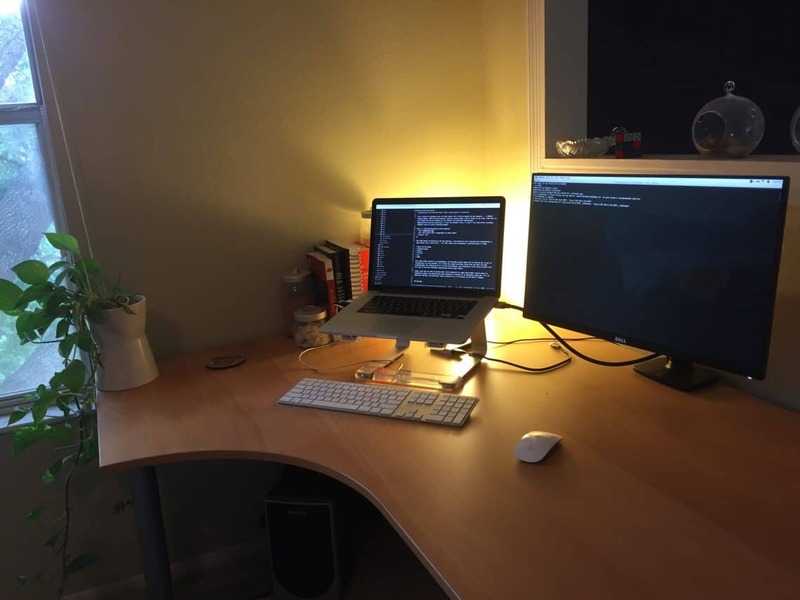 Moving from this setup to a Mac laptop was the biggest computer change for in my life. Being able to use it anywhere has meant that I’m always getting better at using a computer. That’s a weird thing to think about – but even just using a computer can be something you improve on. The more access you have to a computer, the better you’ll get at it. For kids growing up without a computer in their house, they have a huge disadvantage to overcome. 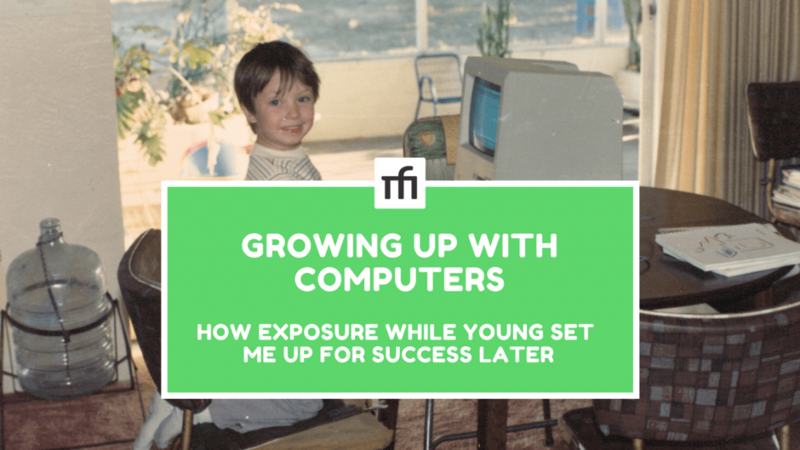 All those years of access to a computer in my house growing up set me up for success in high school, in college and in my career. Nowadays, I don’t typically program isolated in a room anymore. Instead, I’ll settle down on a couch, watch some Daily Show and chip away at a side project or a blog change. When I write or work from home, I plug my laptop in, use a second monitor and pour some coffee. My home office just before we left Orlando to Salt Lake. Even after we moved to Salt Lake City, it was important to create an irresistible staircase for writing. 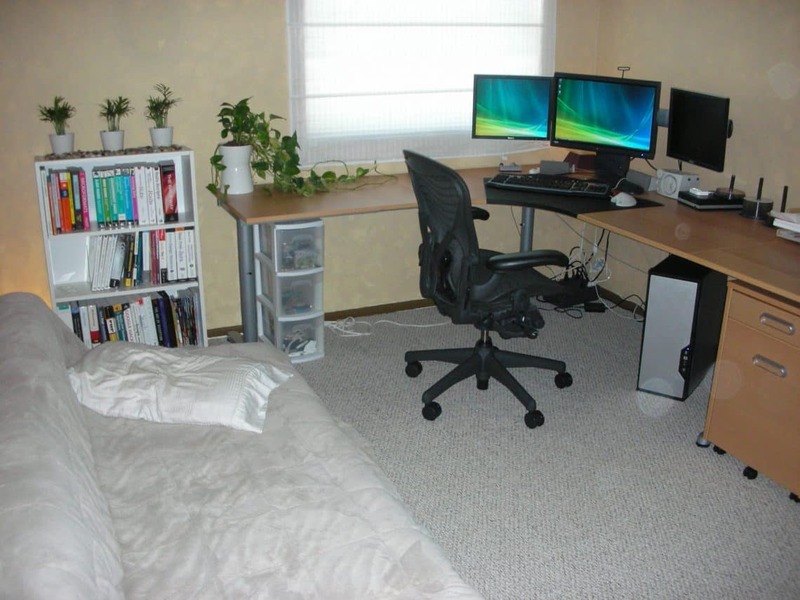 Creating an office immediately was essential if I wanted a dedicated place to get things done. 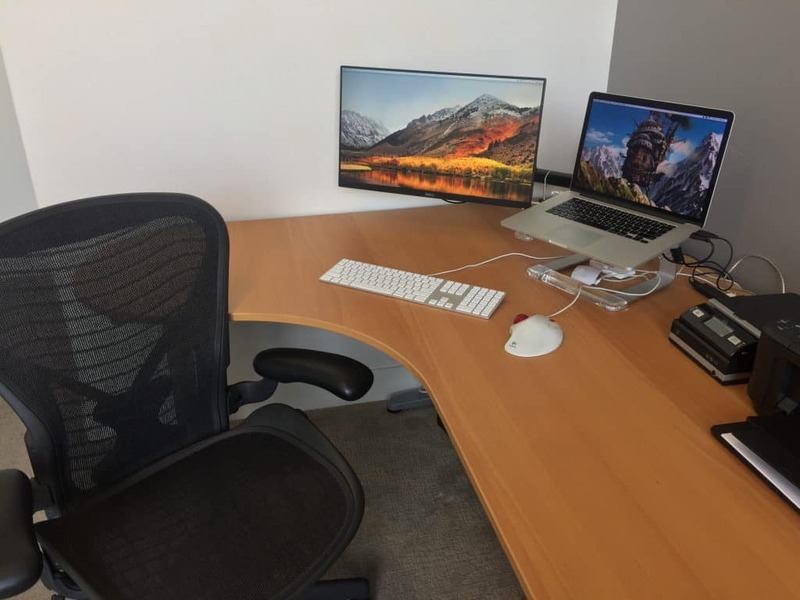 This involved setting up the same desk in a new location. It’s not as natural as the others – I still need to fill it out with a few plants – but the setup is amazing. My home office in our apartment. At Code School, we would all manage and maintain our own computers. This means that I used the same laptop at home on the couch, in my home office, and at work. Making sure that this one computer is running perfectly and is optimized for how I work is important, but also can be a rabbit hole when I target optimization. Later on, we switched to company computers, which gave a much clearer separation of work and personal space. 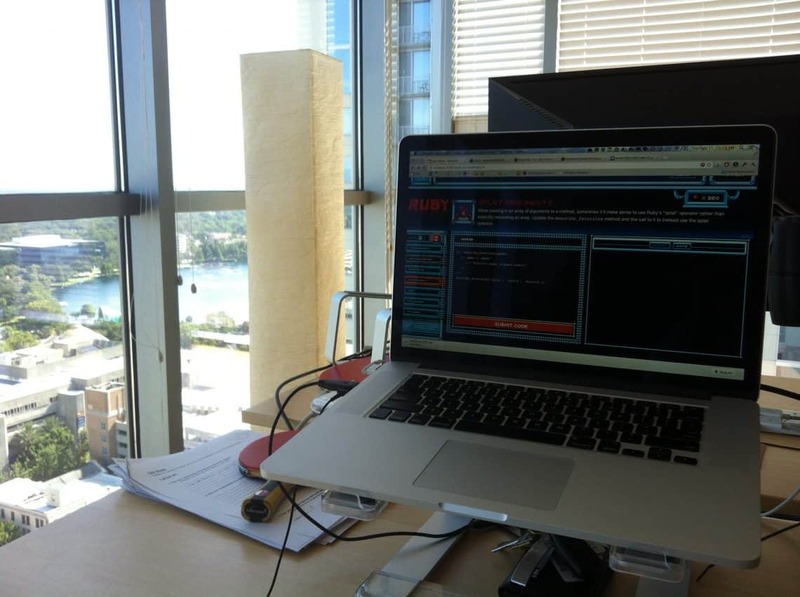 My desk in Code School had a nice view. Whenever I hear talk about privilege, and how that shapes someone over time, this is one of the first things I think about – education. Where would I be without that exposure to computers from a young age? What would have happened without a playground to experiment in? If I wasn’t exposed to programming in high school would I have had the drive to focus on it in college in the same way? I can’t say for sure, but I do know if I’d never been exposed to computers until college, it’s very unlikely I would be a developer today. I remember when we got our first computer – it was a Tandy, which I think was a RadioShack brand – and didn’t have a hard drive. This meant you had to stick a 5 1/2″ floppy disk in to use it. Later, my step dad and mom had a computer from work, so I had exposure to MSDOS and Windows 3.1. 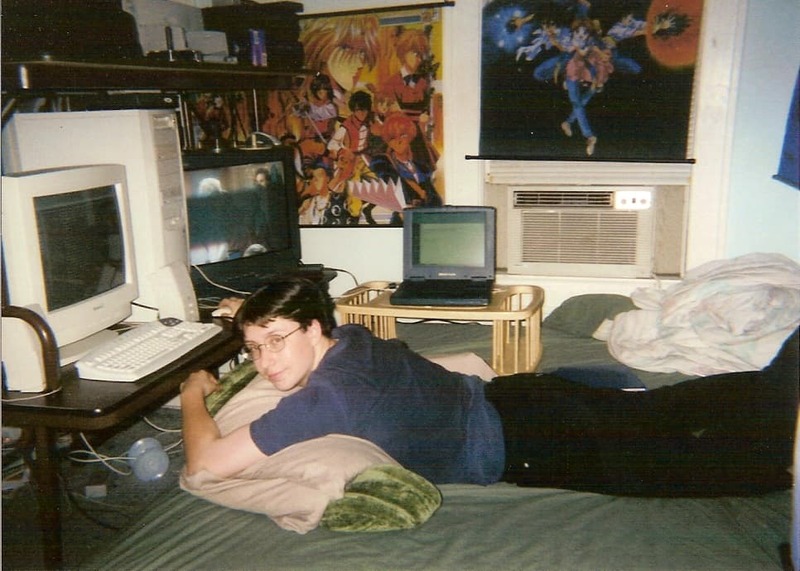 I got my first own PC for Christmas in 1998. Ohh yeah, I remember those massive disks! Sounds like you got your first computer right around the same time I got mine as well. Even though I was already a teenager when the first personal computer came out, I didn’t have one until many many years later. My family simply couldn’t afford it. Back then it didn’t penalize me too much since the Internet was immature and the World Wide Web didn’t even exist, but nowadays I feel it’s hugely important to get kids playing with computers. STEM skills pay big bucks, and if you can light a fire in a child at an early age you’ll set them up for success! Getting people exciting and lighting a fire about tech at an early age is crazy important for sure. There’s something about having something to work on that’s fun on a computer that helps so many skills at once. It keeps that fire going. You are right, what an advantage. I’m a boomer so you’d think I’d be computer challenged but my dad, a greatest generation World War II navy aircraft carrier veteran bought the very first IBM personal computer marketed and always had at least three computers networked together even in his eighties when he was living in a nursing home! My brother, my dad and I were emailing each other before the internet came to be using the Prodigy network, a system run by Sears company. All of that is ancient history but the advantages that family history gave me in my engineering career made a huge difference much as it has in your life! Great post. That’s an extremely early introduction too! I remember Prodigy, but never used it myself.